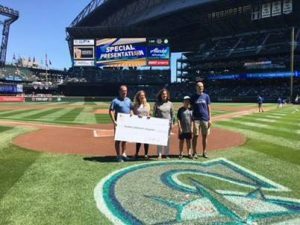 Seattle, WA – Seattle Area Credit Unions hosted a ‘Credit Unions For Kids (CU4Kids) Day’ at a Seattle Mariners game on July 22, 2018. This wasn’t your typical day at the ballpark, Peninsula CU CEO and Seattle CU4Kids Advisory Group Chair, Jim Morrell, organized other credit unions and community members to rally together and raise funds for Seattle Children’s Hospital. The funds raised are directed towards supporting uncompensated care, which is the portion of the steep medical bills not covered by insurance. This makes sure every child has the opportunity to get the full treatment they need. 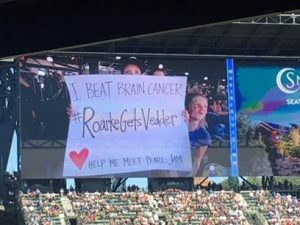 For every ticket sold by the group, $5 went to Seattle Children’s. They also hosted a silent auction at the game, which was staffed by volunteers from the Greater Seattle Area Young CU Professionals group. Finally, CO-OP Financial Services also matched every dollar raised! Before the game, the group had the very special opportunity to share a GIANT check of the total funds raised on the field (pictures below). The check for $342,595 represents the total funds raised for Seattle Children’s Hospital by CU4Kids in 2017. Those funds were raised through golf tournaments, credit union campaigns, and the NWCUA’s annual CU4Kids Auction held during MAXX. Total funds raised at Sunday’s game will be just under $9,000! The CU4Kids Seattle efforts are two years into a five-year commitment to raise $1 million. So far, they have raised $600,000, with a 2018 goal of raising $400,000 more to meet their $1 million pledge. CU4kids is a program run by Children’s Miracle Network (CMN) Hospitals. In over 22 years of partnering, CU4kids has raised an astonishing $170 million+! CMN Hospitals raises funds and awareness for 170 children’s hospitals around North America, with every dollar raised staying in each local community. To learn more about CU4kids and CMN Hospitals, visit the website here. Next post: 27th annual Speedway Miracle Tournament drives phenomenal results for the kids!